The Marianist Province of the United States has made a $1.5 million pledge toward an endowment of the Marianist Chair in Catholic Education Leadership, as part of the Center for Catholic Studies at St. Mary’s University. The Rev. Martin Solma, S.M., Provincial of the Marianist Province and St. Mary’s Chancellor, announced the gift to the St. Mary’s Board of Trustees last week. St. Mary’s will provide a match of at least $1 million through the Defining Moment campaign. 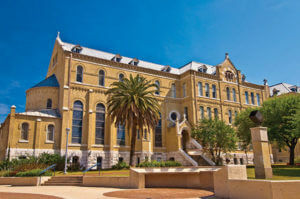 The resulting $2.5 million endowment will be sufficient to recruit and retain an experienced Catholic education academic. The Chair holder’s responsibilities will include development and supervision of a master’s degree in Catholic Education Leadership, intended to create future leaders in Catholic grade school and high school education in San Antonio and the Southwest. Because Catholic education administrative leadership requires, among other things, an understanding of finance, law, organizational management, as well as expertise in education theory and practice, Catholic theology, and Catholic social teaching, this master’s degree will be interdisciplinary and require students to take coursework that draws on several disciplines located in the St. Mary’s School of Humanities and Social Sciences, the Greehey School of Business, and the Center for Catholic Studies. The Center will explore Catholic and Marianist views on the most pressing social policy issues. It also will examine the Catholic Church in society and culture, including issues related to the Church’s presence in the Southwest and the growing nationwide Hispanic presence in the Church and other Christian denominations. St. Mary’s will play a lead role in advancing Catholic studies through recruitment of distinguished faculty in Catholic philosophy, theology, and other central areas of Catholic studies and culture. The University already has appointed faculty members to an endowed Chair in Human Dignity and an endowed Chair in Catholic Philosophy. The Beirne Director for the Center will be announced this summer. In addition, St. Mary’s has hosted the archdiocesan Assembly since 2015, welcoming 4,000 archdiocesan members from 17 counties. The University also is partnering with the Society of Mary for the U.S. Province and the Archdiocese of San Antonio to transform Holy Rosary Parish into a dynamic parish with programs for youths and young adults. St. Mary’s has a long history of involving its students, faculty and staff in service and civic engagement efforts, and the Center will continue this tradition.